Some commented we’ve felt all four seasons last week! This additional weather event didn’t help with stress levels. Disaster stress stages can include heroic, honeymoon, disillusionment, and reconstruction. Heroic was at the beginning of the blizzard/flood disaster. This quickly progressed into the honeymoon phase where we’ve seen an outpouring of support to help with donations, clean-up, etc. It’s very heart-warming and provides some hope in the midst of disaster. While there’s overlap of phases, we’re seeing more of the next stage called ‘disillusionment’ now. This phase can last a year with events like this past week’s weather triggering new anger, grief, loss. It’s during this phase that people more affected by disaster can feel forgotten as others not affected move on with life. And, those not as affected as neighbors/others may experience guilt. For any type of stress, it’s important to talk to a trusted friend, family member, counselor, pastor and not isolate. Unhealthy coping can include turning to substance abuse or other unhealthy options. I’ve been asked what can be done to help. Perhaps the biggest help is to keep praying. Also, keep checking on and reaching out to friends, family, neighbors. These things are more helpful than I can express here! Reminder: the Wellness for Farm and Ranch Families webinar will be held on April 23rd from Noon-1 p.m. at: http://go.unl.edu/farmstresswebinar. In-Season Nitrogen: I know several were glad to get some nitrogen on last week! For those in NRDs which require nitrogen rates based on UNL recs, it’s important to note that the UNL nitrogen equation uses a weighted average soil nitrate test for the ppm Nitrate. A minimum of 2’ is required. Thus, if you only have a 0-8” soil sample, you have to account for a weighted average or the equation will overestimate the amount of soil nitrate and result in a lower requirement than what may be needed. The Extension circular “Fertilizer Recommendations for Corn” (http://extensionpublications.unl.edu/assets/pdf/ec117.pdf) explains this in detail with an example. There is also an excel spreadsheet that does this for you when you input the depth of soil samples taken. If you’d prefer to use the excel spreadsheet, you can find it at the following website by scrolling to “Corn Nitrogen Recommendations Calculator” https://cropwatch.unl.edu/soils. With a full soil moisture profile, some have wondered at the impact of using a nitrification inhibitor with their anhydrous this spring. We have a couple farmers testing this and if you’re interested, here’s an on-farm research protocol: https://go.unl.edu/j9dg. We’ve had some on-farm research studies recently look at sidedress applications using either the UNL equation/Maize N model or industry models such as Climate Field View. In all these studies, the recommended rate was compared to rates that were at least 30 pounds over and under the recommended rate. Some of the studies went as high as +/- 50 lbs/acre compared to recommended rate. I’ve compiled these results in a table at http://jenreesources.com. Take homes: In none of the studies did the addition of 30-50 lbs N/ac above the recommended rate increase the yield statistically. A few of these studies also compared side-dress applications vs. pre-plant alone. One situation resulted in a statistically lower yield with pre-plant alone while the other two resulted in no yield differences. In-season nitrogen studies is our featured on-farm research study this year. You can find protocols at: https://cropwatch.unl.edu/farmresearch/extensionprotocols. Soil Temperatures: Soil temperatures are available at https://cropwatch.unl.edu/cropwatchsoiltemperature. Your local field and lawn conditions may vary, so you can check with a meat thermometer at 4″ depth. It’s too early for crabgrass preventer. More on that and planting considerations next week. #NebraskaStrong also means being strong enough to ask for help. Nebraska Family Helpline: 888-866-8660. Nebraska Farm Hotline: 800-464-0258. *Denotes that treatment was statistically different from others for a given year and location at the 90% confidence level. All other treatments without this denotation are not statistically different although they may be numerically different due to variability. We had our 4-H Festival tonight in York. Sometimes I need to be reminded how cool ag is and not take it so easily for granted. Watching the kids exclaim “that is so cool!” when looking at fungal spores under the microscope or seeing both youth and parents be amazed to see the root and early leaves with soybean dissection repeatedly brought a smile to my face. Any youth ages 6-18 are welcome to join me every month for Crop Science Investigation (CSI). At each meeting, the youth become detectives to solve a real-life problem about plants. Learning is hands-on, youth don’t have to be in 4-H to attend, and also can be from outside of York County. Our next meeting will be March 25th from 5-6 p.m. at the York Co. Extension Office and every third Monday of the month after that. Please contact me at jrees2@unl.edu to RSVP or for more information. On-Farm Research Brainstorming Meeting: Last week I shared about on-farm research and the updates that are occurring this week throughout the State. Because we cover so many research projects at those updates, there’s not a lot of time for growers to just brainstorm and talk about projects they’re considering for this year. So, I’m having an on-farm research brainstorming meeting on Monday, February 25th from 10 a.m.-Noon at the 4-H Building in York. I will also provide lunch at Noon for those attending in person. We will also have a distance connection available for Extension Offices in other parts of the State and I can share that link with anyone who is unable to attend in person. Please RSVP to me (jrees2@unl.edu) if you plan on attending or if you would like to join us via weblink. Purpose: Brainstorm on-farm research topics to conduct this year and better determine who is interested in which studies to see if we can get several to conduct the same study. A number of growers have contacted me since harvest with project ideas. What has been shared thus far include: interseeding covers at V3-V5; biological products including some heard about during No-Till on the Plains; renewed interest in applying sugars; soy pop looking at impact on soybean stem borer; economics of lower corn pop with high flex hybrid under irrigation vs. current pop; second year for some on early vs. later maturity group soy planted early; Chris Proctor and my interest in small grain or other cover on soybean endrows (document palmer); comparison of sorghum vs. corn in non-irrigated setting looking at economics for Nebraska. Come with any topics you’re interested in discussing and looking forward to the discussion! Soybean Seed Quality: The wet fall brought challenges with harvest and seed quality. Purple Seed Stain (left) and Phomopsis Seed Decay (right). Photo by Jenny Rees, Nebraska Extension. Not surprisingly, we’re hearing about reduced germination for soybean seed next year. There’s an article in this week’s CropWatch at http://cropwatch.unl.edu that goes into more details. Essentially in seeds infected with fungi causing purple seed stain and also phomopsis seed decay, reduced germination is occurring. Steve Knox, manager of the Nebraska Crop Improvement Association shared that while a few lots came in at or above 95% germination, results are averaging in the mid 80% range. In a typical year, soybean seed lots tested by the Nebraska Crop Improvement Association (NCIA) range from 88% to 98% germination. This year samples thus far ranged from 43% to 98% germination. The minimum germination for certified soybean seed is 80%, as set by the Association of Official Seed Certifying Agencies (AOSCA). The Nebraska Department of Agriculture has set a minimum germination standard of 75% for soybeans. On a phone call, Steve mentioned that all the moldy and dead seed were removed from the samples before conducting germination tests. They did test the purple seed stained soybeans and found little to no germination reduction in infected seeds. Purple seed stain is seed transmitted; thus, if you have seed lots that are infected at planting, you may notice it at harvest as well. You may also have noticed soybean seed last fall that had very tightly wrinkled seed coats. This was due to the continual wetting/drying process beans went through with rain and wind events. Steve said soybeans with those characteristics didn’t germinate at all thus far but there’s few soybeans with those characteristics in most seed lots tested thus far. Iowa State research found that adding a fungicide seed treatment to lower quality seed could increase the germination percentage up to 15%. However, a fungicide seed treatment won’t improve germination of dead or dying seeds. Seed treatments should be considered when germination rates are below normal and when you’re planting into cold, wet soils. It’s important for growers to check the germination rate of soybean seed this year. Regarding any adjustments for seeding rates, when we conducted on-farm research soybean seeding rate studies, we did not adjust for the germ on the bag (seeded 90K, 120K, 150K, and 180K with no adjustments). However, every seed lot had at least 90% germ in those studies. We’re not recommending to adjust for 80-98% germ if the grower seeds 150K+ because there’s already enough seed planted without adjustment based on our research. However, those planting less than 150K may wish to consider adjusting this year if germination for their seed is in the 80-89% range. On the first day I started Extension nearly 15 years ago, I met two other Extension Educators and a farmer in a Clay County farmer’s field. The farmer was cooperating with us in an on-farm research project. It was great for me to see farmers answering their own questions by partnering with Extension to conduct field-scale, replicated research on their own farms. It also became a key tool for me to learn via field observations and build relationships with growers. Any of you who know me know on-farm research is something in which I’m pretty passionate! The reason? You’re all going to meetings and reading information regarding various practices/products and you may wonder if any of those things will work on your farm. You may try various tests on your own, which can provide some information. But because fields are so variable, scientific tests can’t be conducted by just splitting fields in half or without true randomization and replication. Another reason I believe in on-farm research is because we answer much with minimal money invested! I think of numerous studies our farmers have partnered with us in which University faculty wouldn’t have been able to obtain grants because they were too applied. However, in farmers utilizing their equipment on their own ground partnering with Extension to collect and analyze data, we’ve been able to conduct these studies with minimal cost other than some additional time and travel to fields. We’ve tested numerous products including soybean inoculants, growth promoters, soil health, and nutrient management ones. We’ve tested various practices such as populations, planting dates, planting depths, nutrient timing, cover crops, and much more. A good portion of our results can be found at http://resultsfinder.unl.edu. That site is still missing the first 15-20 years of Greater Quad County on-farm research studies, but everything is there from 2010 on. (I hope to one day help get the rest added). I’m so grateful for all of our on-farm research cooperators-especially to all of you who have worked with me-for your investment of time and trust in partnering! We can’t do this without you! And, I hope more growers consider partnering with us in on-farm research in the future! 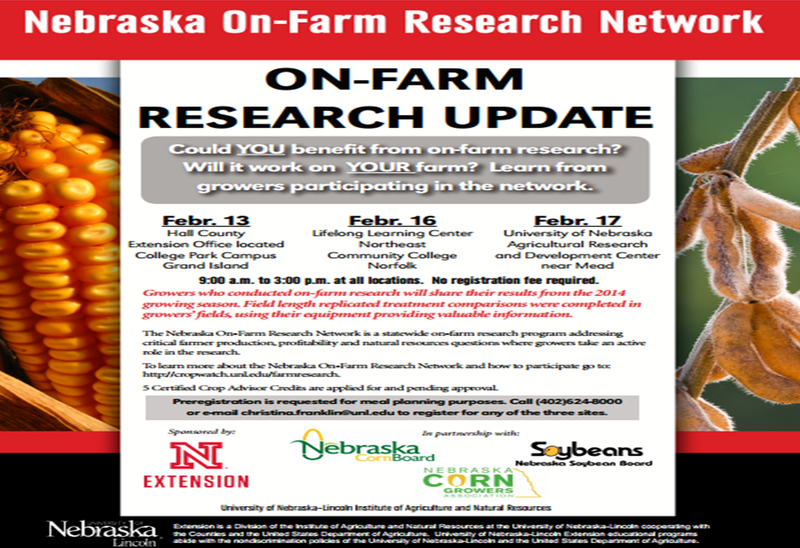 On-Farm Research Updates: Next week will be our Nebraska On-Farm Research updates. It’s an opportunity to hear from the growers themselves who conducted studies in 2018 regarding why they chose their studies, how they conducted them, and what their plans are for the future. I really enjoy these meetings and learning from the discussions! While many of the studies may show there’s no differences, those are still answers to specific questions! Research projects include: cover crops, variable rate seeding, planting populations, starter fertilizer, fungicide applications, alternate crop rotations, seed treatments, and sidedress nitrogen management technologies including drone and sensor-based, variable-rate nitrogen management. Certified Crop Advisor Credits have been applied for and are pending approval. Call (402) 624-8030 or e-mail onfarm@unl.edu to register. Locations and times are listed below. There’s no charge with lunch included due to the partnership of the following: Nebraska Corn Growers Association, the Nebraska Corn Board, the Nebraska Soybean Checkoff, and the Nebraska Dry Bean Commission. Soybean Yield Gap On-Farm Research Project: A number of you have helped through the years in providing field history information for Dr. Patricio Grassini for the Soybean Yield Gap project. That’s the difference between current farm yield and potential yield as determined by climate, soil, and genetics. An analysis of survey responses from over 2000 soybean producers indicated a 20%-30% yield gap for soybean. In Nebraska, three practices have been identified as being important for improving yield and producer profit: planting date, seeding rate, and the use of foliar fungicides and insecticides. An on-farm research study in eastern Nebraska is seeking 20 growers to test “improved” practices versus “baseline” practices in 2019 and 20 again for 2020. A PDF handout with the regions and more details can be found at: https://go.unl.edu/h8hc. Please let me or your local Extension Educator know if you’re interested in this! On-Farm Research: It’s been fun discussing on-farm research projects and putting together protocols with growers the past few weeks! Some have asked if there’s already projects for which we need cooperators. We do have those and we also custom develop protocols depending on the question(s) you wish to look at. For those curious about protocols developed, you can view some at: https://cropwatch.unl.edu/farmresearch/extensionprotocols. One question I’ve received quite a bit the past few years is about establishing cover crops into V5-6 corn. We don’t have on-farm research data yet for this study topic, but perhaps this year a few of you will consider it! The thought is to get the cover established, even though it won’t grow much during growing season, and hopefully provide for faster growth after harvest. I have developed an on-farm research protocol if growers are interested in trying this (it can be found at the same website listed above). In our brainstorming session, growers talked about interseeding via retrofitting equipment to put seed on similar to Y-drops, using a coulter, or seeding during cultivation. There is also a field day on March 21 to discuss what one farmer has tried the past three years regarding different seeding mixes and ways of establishing the cover at V6. If you’re interested in attending, it will be held at 4th Ave and 1/4 mile north on Arthur Road near St. Libory, NE from 1:30-3:30 p.m. The following website has more information regarding this field day: http://cpnrd.org/wp-content/uploads/2018/03/Cover-Crop-Field-Day-Flyer-March21.pdf. If you’re interested in attending, please RSVP Dean Krull: dkrull1@unl.edu. Please let me know if you’re interested in the V6 cover crop protocol as well! Also just a note, this protocol can also be adapted for any of you looking at applying nutrients during that V5-V6 time-frame. The plot pattern would be the same; the objective and perhaps some of the data collection would change. Soil Moisture Status in Non-Irrigated Fields: This week I plan to install soil moisture sensors into some non-irrigated fields in the southern area of counties I serve. I’m just curious where we’re truly at for soil moisture deeper in the soil profile knowing Kansas is in drought and moisture this winter has been spotty. I did this in 2013 as well to see where we were at after the drought of 2012; it showed we didn’t have a full soil profile going into the growing season. If you have moisture sensors, you may wish to consider doing this as well for your fields or pastures to know where you’re at. It may influence cropping decisions for 2018. If you connect sensors to dataloggers, you will want to also install a temperature sensor to allow the datalogger to base the moisture readings on the current soil temperature. Check out this week’s UNL CropWatch at http://cropwatch.unl.edu for information on averaged land values dropped by 3% from 2017, negotiating fair leases, assessing alfalfa winterkill, interseeding into thin alfalfa stands, and more. Innovative Youth Corn Challenge: Nebraska Extension and the Nebraska Corn Board are offering the seventh Innovative Youth Corn Challenge contest. This contest, open to 4-H members (age 10 & older as of Jan. 1st) or FFA members (in-school members), guides participants through all aspects of corn production, as well as agricultural careers related to corn production. As a team (2 or more participants), youth will be challenged to implement a production practice different than normal to determine if they increased their yield. Economics and sustainability of the practice will also be considered. Yields, cropping history, and production information will be collected in the Corn Yield Challenge management summary. Cash prizes and plaques are given. First place receives $1,000, second place receives $500, and third place receives $250. Sustainability, crop scouting and “extra mile” awards are also given as cash awards. To participate in 2018, youth must complete and return an entry form by APRIL 1st to the Fillmore County Extension Office in Geneva, NE. Forms can be downloaded at https://cropwatch.unl.edu/youth/cornchallenge. For more information, contact Brandy VanDeWalle at brandy.vandewalle@unl.edu. Horticulture Information from Kelly Feehan, Platte County: “Interested in getting an early start on vegetable gardening? You don’t need a greenhouse; just check out row covers that can be placed over plants to provide some protection from cold temperatures. Row covers are spun-bonded or woven polyester or polypropylene material that can be placed over plants to extend the growing season by retaining heat. Row covers are permeable and allow in light, water and air for plant growth. Depending on the weight of material used, between 2 and 8 degrees of frost protection can be gained, allowing earlier planting in spring or later planting in fall to move the harvest season up by a week or two or extend it a week or two later in the fall. Row covers can be draped over plants and secured with bricks; or they can supported by hoops, in which case they’re called low tunnels. Low tunnels are an easy and good season extender for home gardeners to use. On-Farm Research: Last week a team of us did a series of meetings throughout the State regarding on-farm research updates. It’s always great to have the farmers presenting their research and adding in additional details that we didn’t have when the results booklet was published! Two more meetings continue in western Nebraska this week. Perhaps my biggest reason for strongly promoting on-farm research is because there often is no better way to obtain answers to some of the questions you all have. These types of studies are often difficult to obtain funding (or can take months to obtain funding, resulting in a lost window of opportunity) and by conducting this research on your farms, we obtain the answers for your specific situations. Sometimes challenges such as storm damage also become opportunities to answer a question via on-farm research. Growers tend to appreciate research conducted on other growers’ farms when we share this research at various meetings, field days, and in articles. A variety of topics are researched every year including nutrient management, various products, row spacing, and new technologies including multi-hybrid planters, use of drone sensors, etc. In this week’s UNL CropWatch at http://cropwatch.unl.edu, three on-farm research cooperators are featured. One of these is Ken Herz along with sons Zach and Aaron in the Lawrence, NE area as first-time cooperators. Ken approached me with several questions the winter of 2015. As growers with a non-irrigated, no-till wheat/corn/soybean rotation and a cattle operation, his family was curious about the impacts of grazing cover crops for cattle gains and improving soil organic matter. They were also curious about the trade-offs of the cover crop vs. any soil moisture loss or impact on the successive corn yield. They also wanted this study to be something that would be applicable to what farmers in this area did and something they could all learn from together. Thus, it was decided to not plant cover crops into the corn or soybean residue as that isn’t common and this would need to be a long-term study. Dr. Mary Drewnoski and I met with the Herz family to develop a plan for this study. Also thankful for Dr. Suat Irmak for his help in providing additional soil moisture equipment and advice I needed, to the Little Blue NRD in partnering with reduced cost of soil moisture equipment and also for the partnership of Green Cover Seed. In 2016-2017, this study evaluated four treatments on the effects of successive corn yield: 1-ungrazed wheat stubble 2-grazed wheat stubble 3-ungrazed cover crop 4-grazed cover crop. Wheat was harvested July of 2016 and a five-species cover crop mix of spring triticale, winter peas, oats, collards, and purple top turnips was planted August 14, 2016 (they wanted a mix that would winter-kill). The cover crop received moisture within a week of planting that allowed for germination. Some additional fall moisture allowed for good growth and cover crop biomass was measured (3401 lb/ac) prior to grazing 28 (1100 lb) first-calf heifers for 22 days resulting in the cover crop carrying 2.4 animal unit months (AUM)/ac. The goal was not to graze too heavy to allow for ground cover and any long-term soil improvements, thus 2177 lb/ac of biomass was present post-grazing. Soil moisture was monitored from after cover crop planting through corn harvest. The soil was so dry after wheat harvest prior to planting the cover crop that it took using a drill to install the second and third foot moisture sensors. Beginning soil health parameters were also taken to be compared long-term in this study. Corn was planted May 15, 2017. Prior to planting the corn, the soil moisture where the grazed and ungrazed cover crop plots were located were at 35% depletion (top three feet) compared to at field capacity (full soil moisture profile) in the grazed and ungrazed wheat stubble plots. Eight inches of rain in May evened out the soil profile allowing all plots to be at a full profile (top four feet) at the beginning of the corn growing season. As the season progressed, the grazing treatments started separating out from the ungrazed treatments from July through end of the season. I don’t know how to explain that yet. Corn was harvested the Thursday of the major wind event with a calibrated grain wagon. 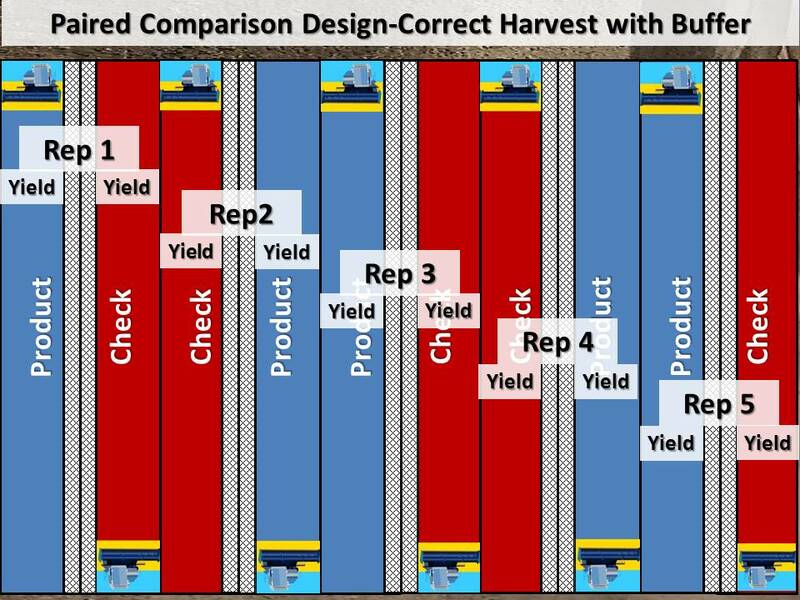 Yields were not statistically different and were 218 bu/ac, 211 bu/ac, and 213 bu/ac for the ungrazed wheat stubble, grazed cover crop, and ungrazed cover crop respectively. The grazed wheat stubble treatment yielded 212 bu/ac but only had two reps at the end of the growing season so was not included in the statistical analysis. Economically, grazing the cover crop was as competitive as the ungrazed wheat stubble treatment when it came to ensuing corn yields and the spring rains made all the difference in beginning soil moisture. Because of the crop rotation, there wasn’t an opportunity to add a cover crop in this field Fall 2017. The Herz’ feel they lost an opportunity as environmental conditions vary so much every year, and this year, cover crops didn’t have as much growth in area fields. Thus, they’ve chosen to dedicate three fields to this study topic in the future, allowing for one of the fields each year to have wheat/cover crop/grazing to account for environmental variation. Continuing this for the next 5-7 years will better answer their questions while benefiting all of us with what is learned. Perhaps other growers are interested in some variation of this study for your farms? Most studies are not this in depth and this is just one example of how growers are answering questions they have for themselves via on-farm research. It can take extra time at planting, harvest or other times of the season depending on the study. I believe most growers I’ve worked with would say the effort has been worth it to scientifically answer their questions for themselves. Truly am grateful for all of you I’ve had the opportunity to work with via on-farm research! So, if you’re thinking about a question you’d like to answer on your farm this year, consider reaching out to me or your local Extension educator and we’d be happy to talk with you now about how to set up your study. It is important to talk this through, especially if this is your first time conducting research. If you’d like to learn more about on-farm research, view some protocols, or view results from previous studies, please check out our website at http://cropwatch.unl.edu/farmresearch. Bake and Take Month: March is Bake & Take month, a time when wheat organizations encourage others to bake a wheat good and share it with family, friends, neighbors, co-workers and shut-ins. In honor of the month, the Nebraska Wheat Board (NWB) is again sponsoring recipe cards and stickers for any 4-H groups or other organizations that wish to participate. This year’s recipes are mini dessert tacos and crockpot cherry chocolate lava cake. Those interested in participating or who have questions can contact the NWB office at (402) 471-2358 or wheat.board@nebraska.gov. There is no cost for the supplies, and no limit on the number that can be requested. Those wishing to preview the recipes before requesting materials can find them listed at http://wheat.nebraska.gov starting March 1. York County Fair Volunteers: Gary Zoubek asked me to mention he’s looking for a few volunteers that could help with 4-H and Open Class primarily on entry and judging day in Ag Hall on July 31 and August 1st. If you’re interested, please contact Gary at 402-326-8185 or email gary.zoubek@unl.edu. This study was conducted on a 40 acre field. Plot sizes are the same other than the grazed wheat stubble area which will not be included in the future. Aerial imagery was also taken throughout the growing season. The corn received hail damage on June 12, 2016 but recovered well. Photo showing corner of 4 plots after grazing. Cattle were hard on my dataloggers but I had chosen to not fence them off as I wanted the true grazing data! Grazed treatments in background and ungrazed in forefront (cover crop left side and wheat stubble right). The cattle didn’t really graze the wheat stubble-tended to lay there as it wasn’t bumpy like cover crop area. Ultimately this led to bare soil in this area and we will not have this treatment in future years. Observation showing importance of bare soil on Palmer germination: the grazed wheat stubble treatment turned to bare soil from where the cattle lay (not intended and something we learned). Could tell the treatment difference to the line even at harvest. June 8th: few Palmer plants in ungrazed wheat stubble (forefront) compared to in bare soil area (foreground). June 15 (3 days after June 12 hail storm): still only a few Palmer plants in ungrazed wheat stubble but it exploded in the bare soil area. These observations show what research has also shown regarding importance of light on Palmer germination and bare soil. There was minimal Palmer in the grazed cover crop area and was comparable to the ungrazed wheat stubble and cover crop areas. The Palmer put on 2 leaves from June 12-June 15. The corn barely grew in the whorl in that same time-frame. Corn dicamba product did a great job in killing the Palmer after allowing the corn plants to recover a few days & this situation was common throughout the area in 2017. Always learning with on-farm research! I didn’t ask how corn fertilizer occurred so we had to remove sensors and re-install upon spring anhydrous application. Beginning soil moisture data shown here is from anhydrous app to day before planting. Cover crop treatments were at or close to 35% depletion (where we would typically trigger irrigation for silt-loam soils). Wheat stubble treatments had full soil moisture profile this entire time period. Late April and May rain events (8″ of moisture in May) allowed for a full soil profile at corn planting for all treatments with separation of treatments not occurring till mid-July. 2017 vs. 10 year average rainfall for this area of the State-blessed with rainfall in 2017. Another one of my favorite winter meetings, and honestly, one of the most powerful farmer learning experiences I have the opportunity to take part in, is the Nebraska On-Farm Research Network and the winter Updates! Why is this such a powerful experience? Because the farmers who conduct the research are the ones presenting what they did, why they did it, and their results! The discussion amongst farmers, ag industry, and Extension is highly engaging and thought provoking. Great questions are asked. But even more powerful is the understanding that occurs on what valid research is and how to question what one sees and hears presented at meetings, in magazines, and online. The Nebraska On-Farm Research Network is sponsored by the Nebraska Corn Board and Nebraska Soybean Board via your checkoff dollars and this year we are having meetings at three locations in the State. February 13th will be at College Park in Grand Island; February 16th at the Lifelong Learning Center in Norfolk; February 17th at the ARDC near Mead and all meetings will begin at 9:00 a.m. and last till 3:00 p.m. There is no charge for these meetings but pre-registration is needed for meal count and ensuring we have enough materials and space. Please pre-register for all meeting locations by calling (402) 624-8000 or email christina.franklin@unl.edu. There are five CCA credits pending approval. Hope to see you at one or more of the meetings! Still Time for On-Farm Research! With the recent rains and cooler weather in the State, producers still have an opportunity to consider conducting an on-farm research experiment that may be of interest to you! So far this year we have producers conducting nutrient management, irrigation timing, cover crop, seeding rates and dates, fungicide timing, and studies of various products on the market including sugar products. You can learn more about conducting on-farm research at our Nebraska On-Farm Research Network Website, our On-Farm Research Grower’s Guide, by Contacting a UNL Extension Educator or Specialist, the Nebraska Corn Board at 402-471-2676 or Nebraska Corn Growers Association at 402-438-6459. You can also learn more from our producers themselves in the video below. We hope you will consider conducting on-farm research this year to answer the questions you may have in your operation! 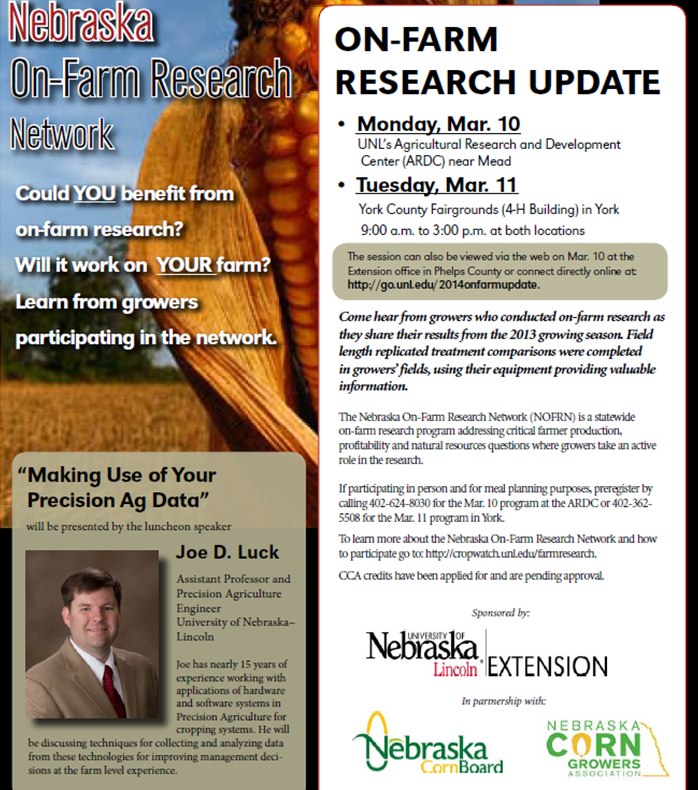 Hope to see you next week at our Nebraska On-Farm Research Updates to be held March 10 at ARDC near Mead and March 11 in York!!! Listen to the value of on-farm research to these participants! Sound interesting to you? Learn more by checking our our On-Farm Research website or contacting any of our faculty involved! 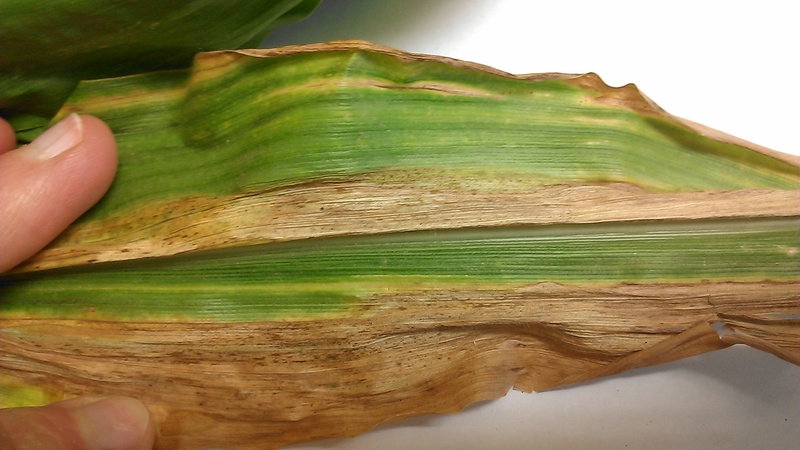 Goss’ wilt was found this week in corn damaged from Memorial Day storms in Clay County. I’ve also received pictures that appeared to be Goss’ from crop consultants in other areas of the State. Goss’ wilt lesions have a wavy edge, have a varnished look to them when wet, and have characteristic black “freckles” within and particularly along the lesion edges. We are seeing some plant death due to the systemic version of Goss’ wilt. This can be seen by taking a cross-section of the stem and looking for orange discoloration in the vascular bundles. Because this is a bacterial disease, fungicides are not effective in controlling Goss’ wilt. If you are interested in trying a product that is labeled for treating bacterial diseases in corn, we would recommend you test its effectiveness via on-farm research. 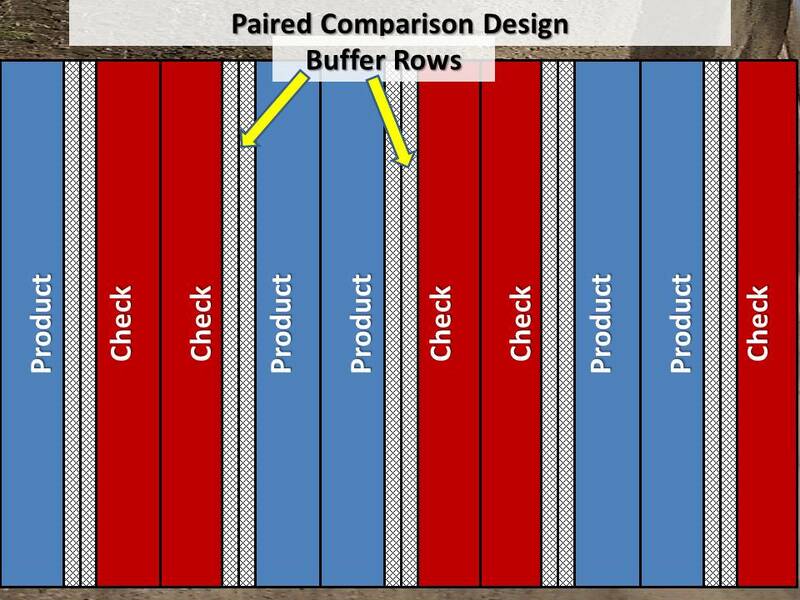 Spraying in a paired comparison treatment design will give you a true answer if the product made a difference for you or not. 1-Spray a pass or round with the product (depending on sprayer size) to ensure you can harvest two passes from the center of the treated area. 2-Skip the same amount of distance as you previously sprayed. Mark a few plants in each plot and take photos throughout the growing season to determine if disease progresses or not. You may also wish to keep track of percent of plants affected in each untreated and treated area throughout the season, and check for percent stalk rot and harvest population in each area before harvest as well. Make sure to harvest two passes from the center of each treated and untreated area. Then compare the weights as shown in the harvest figure. Please let Jenny Rees jrees2@unl.edu (402) 762-3644 know if you decide to conduct this study and if you have any questions!